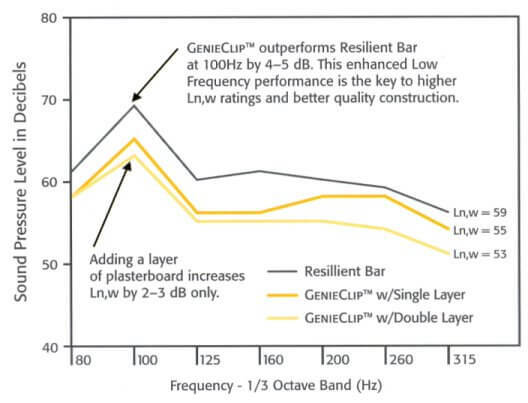 Genie Cliphas been specifically engineered to provide enhanced acoustic performance for the reduction of impact and airborne sound through wall and ceiling assemblies. It is made from recycled components and engineered in a way which allows for a reduction in the overall assembled weight of traditional constructions. Genie Clip is quick and easy to install with the proprietary furring channel. It is extremely stable when held in place with a single screw. The furring channel is simply clipped into the Genie Clip and the plasterboard can be immediately installed. Only one screw is required to install each clip. As a guide we recommend 2 clips and 2 linear meters of channel per square meter. Stud Type 15mm Plasterboard Total Depth Insulation Genie Clip Rw Test no. 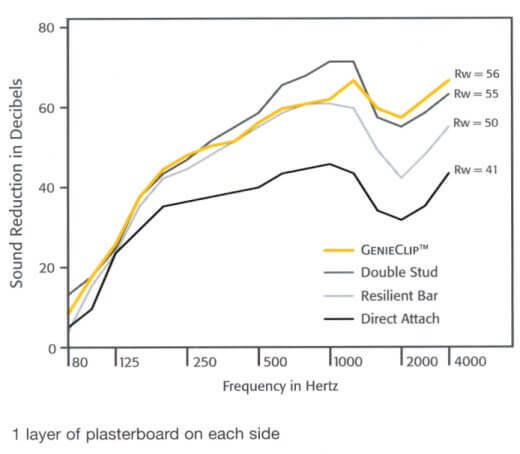 * achieves 7dB improvement whilst saving 2 layers of plasterboard and only adds 11mm extra footprint.